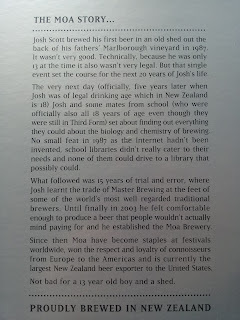 I could write a few paragraphs on the story of how this Marlborough, New Zealand based brewery came to be, but I feel they've captured it perfectly on their packaging (see photo, click to enlarge). The "Proudly brewed in New Zealand" tag-line is something they back up solidly through their actions. More on that later. What their own back story doesn't tell you is that Josh is the son of Allan Scott, a renowned wine maker in this, one of the world's top wine making regions. He grew up in the area and has been around wine all his life. Their respective businesses are barely a few hundred yards apart and I must admit to having genuinely laughed out loud on being greeted by the below sign. I can imagine it creating some banter between Father and Son when it first appeared. 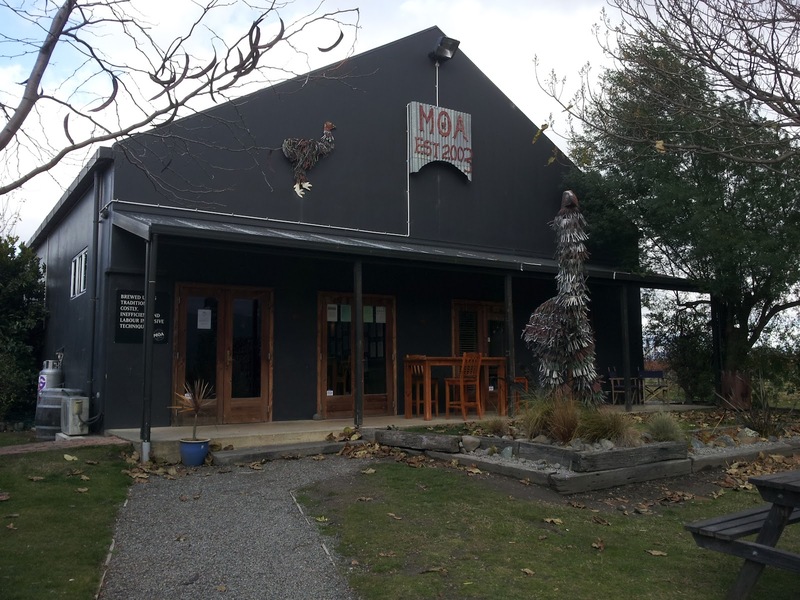 Fittingly, the Moa Brewing Company's premises are nestled snugly between several neighbouring vineyards and the narrow driveway leading up to them takes you between two fields tightly packed with perfectly straight rows of vines. A site featuring prominently in the surrounding area which, as you'd expect given the pedigree, contains many fantastic wineries. 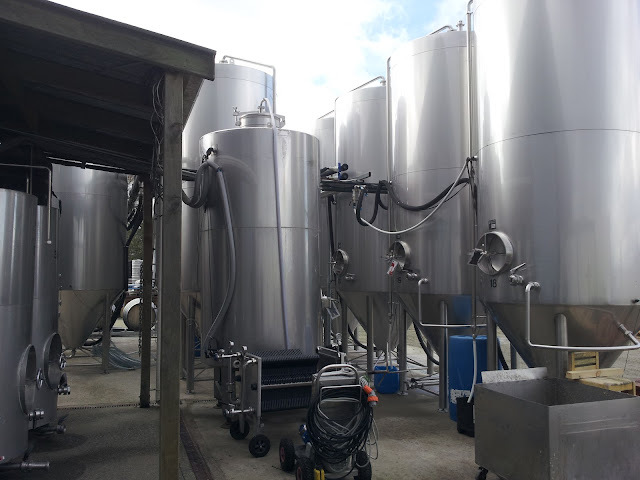 In a future post, I'll talk about the booming hop farms which are now competing for this nutrient rich, fertile land across the top of the South Island (home to Nelson, Motueka and Riwaka). Of course, that means Moa has access to some fantastic locally grown hops and their beers feature them in abundance. "FINALLY SOMETHING DRINKABLE FROM MARLBOROUGH"
The brewery and tasting room building itself looks small from the road but extends to the rear. The sign outside on the left of the door reads "Brewed using traditional, costly, inefficient and labour intensive techniques" - something I'm sure most craft breweries can relate to. We arrived just after opening (11am) on a Saturday morning in June, to be greeted by a cheerful, if camera shy host. Her passion for the beers on the bar was infectious as she poured and talked us through a tasting. 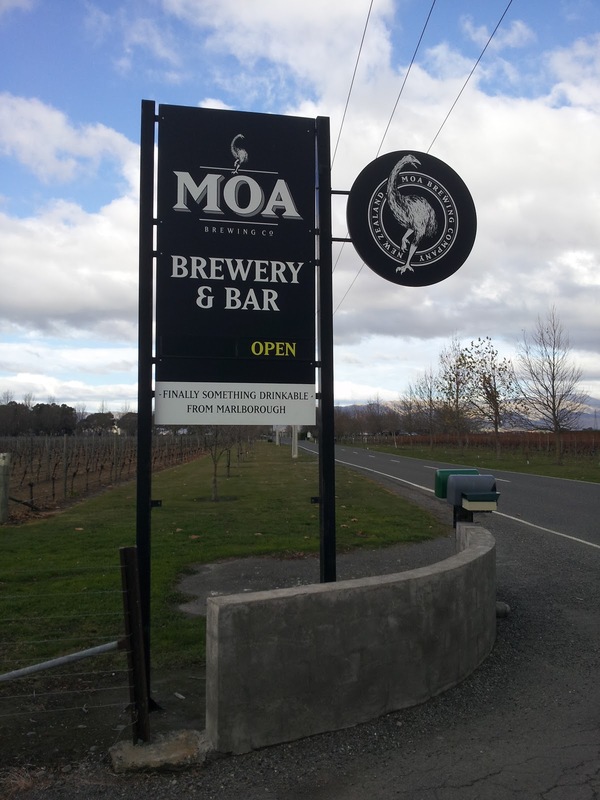 Moa has a core 'estate' range produced in volume and a number of 'reserve' beers, brewed seasonally in smaller batches. Details and tasting notes can be found on their website. 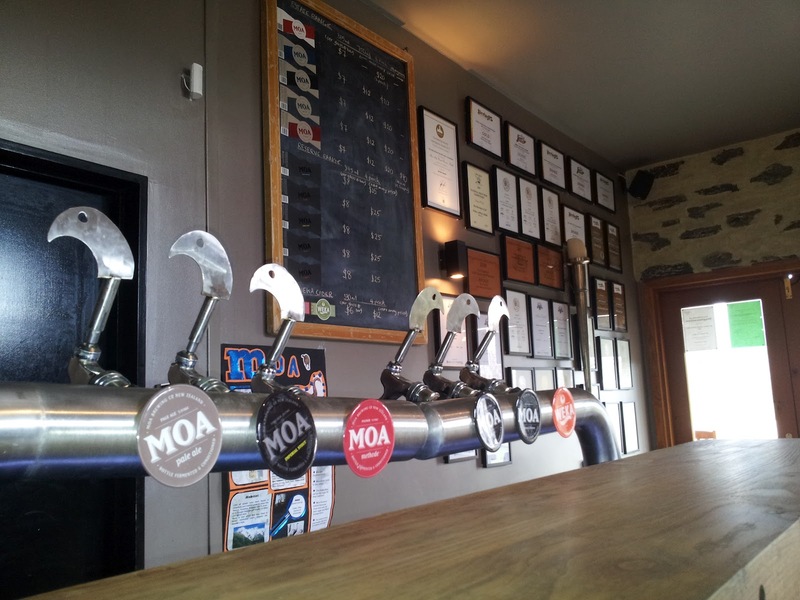 On the bar for sampling were Pale Ale, Methode, Noir, Original, Imperial Stout and Weka Apple Cider. The Pale Ale, which uses both US Cascade and Nelson Sauvin hops, was a standout for me being fresh as a daisy, whereas Jane adored the Imperial Stout aged in Oak Pinot Noir barrels. Takeaway bottles are keenly priced and we took the opportunity to stuff our campervan's fridge full. As we tasted, our host explained that a lot of their passing trade are wine tasters, on self-guided or organised tours of Marlborough region. Her favourite moments behind the tasting taps are those where she manages to open a wine drinker's eyes to the world of craft beer. Each one chalked up as a victory for Moa and what it stands for. 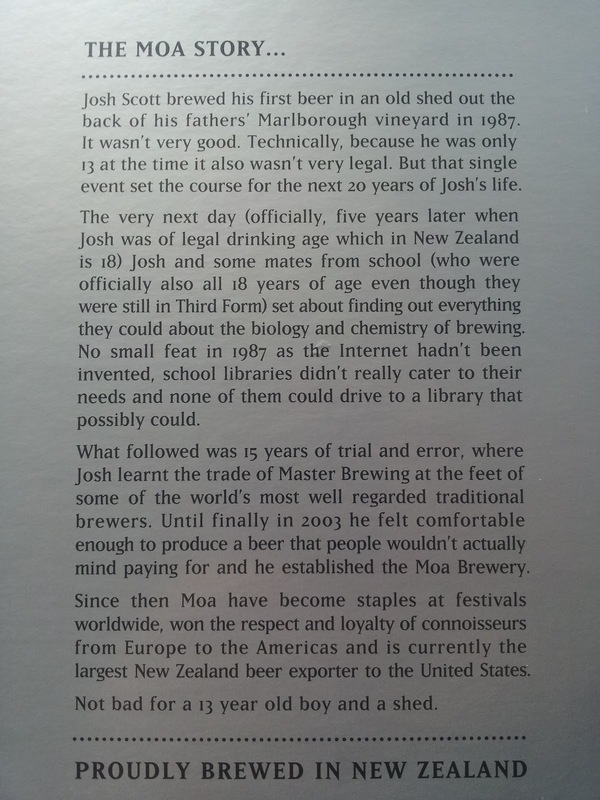 Of course, with Moa's heritage I'm sure they're happy to see both wine and beer thriving in New Zealand but given where they're based, it must be fun to change perceptions. 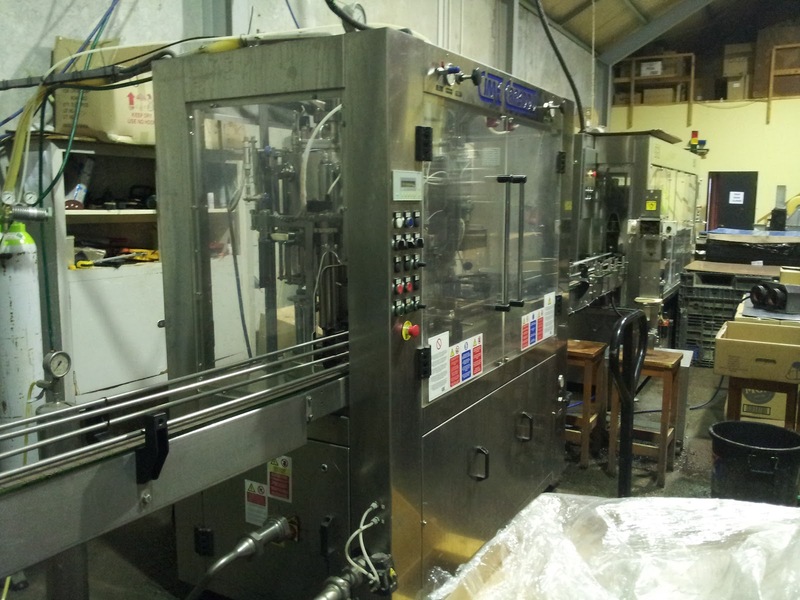 The brewery is fully self contained and I was allowed to sneak out the back for a few minutes to snap some photos of the kit. There is a small viewing window within the tasting room but as they've expanded outside the building, you can't see too much from there. 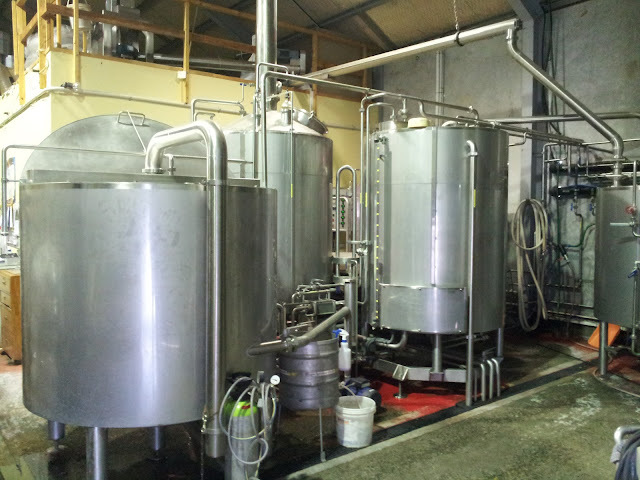 HLT, mash tun and kettle. Perhaps the kit they started on? After visiting the brewery, I sought them out on twitter (@moabeer, worth a follow) and later learned that they were partners/sponsors of Kiwi House, a 'haven for friends, family and proud supporters of the New Zealand Olympic Team' during the London 2012 games, based near King's Cross. They celebrated every medal won by NZ athletes with aplomb, with golds being toasted with $1 beers back home. While those inside the park were supping bland rubbish thanks to multi-national brewing giants securing exclusive rights to sell beer at the games, vistors to Kiwi House were enjoying craft beer supplied by a brewery obviously proud to be kiwi. Kiwi House got through so much Moa that it had to appeal for folks flying in from New Zealand during the latter stages of games to bring more with them (a reward was offered)! I'll drink to that! We did ask. They export primarily to the US and parts of Asia currently. Hopefully the Olympics will have helped raise the profile (and demand) in the UK a bit and we'll see some on UK shores soon. We can but hope! We're in the middle of a preorder period right now for trade customers at James Clay. I think the beer will be coming over Feb/March time - Watch this space. Thanks Ben, that's good news! Purely being selfish, I'm hoping some Pale and Imperial Stout will feature.